By Michelle L. Stock, Ph.D. The worldwide market for lasers in 2015 was steady in terms of overall revenue growth in 2015 according to Allen Nogee, a Senior Analyst at Strategies Unlimited and an expert on photonics markets. While in early 2015 he predicted a growth rate of 6.6 percent over 2014, Nogee is finishing up the year with an estimate (based on data up to the third quarter) of 5.0 percent over all laser markets, beating global economic growth of 3.3 percent but lower than the US stock market for the same period. This, after the US and Europe started the year off well, but fizzled a bit as we move toward the end of the year. 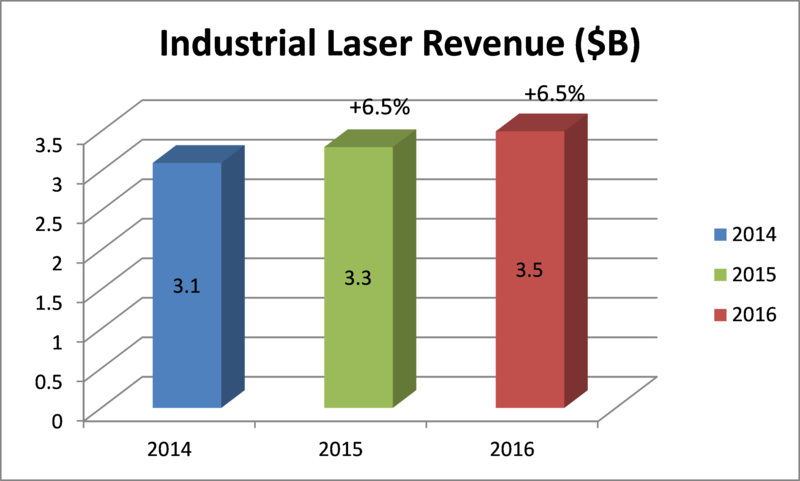 However, when you focus on the industrial laser category, the news is rosier and closer to predictions, with growth in revenue compared to 2014 estimated to be 6.5 percent (see Figure 1 for industrial laser revenues). “Revenue increase over last year in the EU for industrial lasers was 5.5 percent, while in the US it was ~ 6 percent, but keep in mind there were drastic currency changes this year which negatively impacted American companies and helped EU companies because the dollar went up relative to the Euro. Many US companies are complaining that the headwinds from the currency were 6 percent, 7 percent and even 10 percent depending upon when sales occurred.” At the same time Asia, particularly China, fared pretty well to keep things moving along at a steady rate. Big events in the 2015 worldwide economy including currency fluctuations and shocks in the Chinese market did surprisingly little to dampen industrial laser sales. Those factors were probably mitigated by a stabilized US economy and strong government support of advanced technologies in China. With respect to manufacturing in general, “There was a lot of doom and gloom in the industrial sector in the non-laser, manufacturing area, and I haven’t seen that in lasers. Lasers are a tool, often replacing another tool, and new applications are coming about and prices are decreasing. Taking it all into account, that may be cushioning some of the ups and downs (for laser revenues) you usually see in other types of machine tool sales.” As for China, it is likely that the money from China’s government to support laser research, particularly oriented towards developing China into a high-tech manufacturing country, has been increasing over the past couple of years. As Nogee points out, “Ultimately, China wants to get out of manufacturing the low-value, cheap stuff, and wants to be world-class in manufacturing high-value, high quality products.” A key to doing this is to focus on laser material processing. This year, Nogee spent time looking at a class of lasers that has traditionally been used mainly in research labs, but over recent years has found increasing numbers of applications in medical and industrial applications. Known as ‘ultrafast lasers’ – lasers with pulse durations in the femtosecond to picosecond range, these types of lasers are starting to be used in micro-materials processing. According to Nogee, the size of the market has been a big mystery out there. “The guesses I heard were usually on the low end of what I ended up finding, which is about $850M for research, medical and industrial ultrafast lasers. Prices have been dropping, but are still out of line with the applications. A lot of these applications are very specific; ultrafast lasers are not a generalized tool where everyone has to have a lot of them to get the job done.” Of note in this area, fiber lasers are making increasing inroads in this category by replacing primarily DPSS lasers, similar to what they have done in macro-materials processing applications where CW, kW-level fiber lasers have been displacing CO2 lasers and DPSS lasers. However, the precision material processing area is slowing down the most. Smart phone manufacturing has cooled, and doesn’t look likely to grow again very soon. And in the area of additive manufacturing (also known as ‘3D printing’), companies who sell lasers into this market estimate a robust 46 percent growth in 2015 sales. This must be tempered with concern that many of the major laser system manufacturing companies have had their stocks drop to under 25 percent of their price compared to last year. So, how are things shaping up for 2016? Nogee says he thinks we are in a good place with slow but stable growth that will continue in the overall laser market. As long as nothing extreme happens such as terrorism or unexpected economic turmoil causing uncertainty, Nogee’s prediction for 2016 is for a similar growth rate for industrial lasers to 2015 of 6.5 percent. This number could be revised based on fourth quarter data, but for now, the International Year of Light will likely be followed by another year of steady growth – something to celebrate in an often turbulent world.